“Austerity is not our destiny,” said Association pour une solidarité syndicale étudiante (ASSÉ) co-spokesperson and finance secretary, Benjamin Gingras, who spoke to Concordia University students this week. ASSÉ explains that austerity is about “privatizing profits, socializing debt,” which results in the transfer of wealth from the majority to a wealthy few. On November 6th, Concordia students gathered to “Fight the Neoliberal Assault with ASSÉ.” This was just one of several visits that Quebec’s most militant student union has been making to institutions across the province with the aim of building momentum against austerity policies. 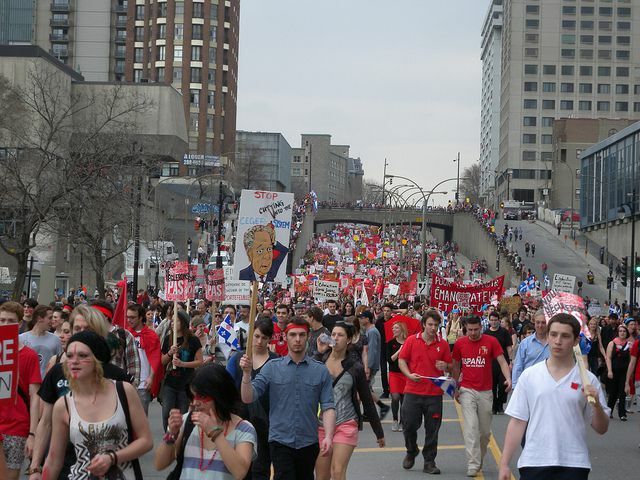 ASSÉ played a leading role in the Quebec student strike in 2011-2012. Now, the student organization is building bridges with other movements in an effort to create a nation-wide movement. It is participating in the Coalition against employment insurance reform, and has been helping the coalition’s in Quebec, Ontario, Manitoba, and the Maritimes. They have been working in solidarity with the Idle No More movement, in an attempt to unite Indigenous, Quebec, and Canadian movements against corporate interests. ASSÉ has been pushing education as an important issue for the upcoming People’s Social Forum in 2014. 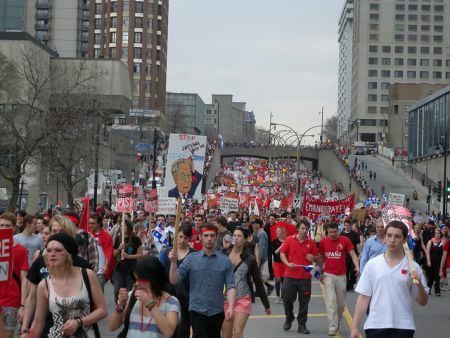 They are building bridges with other student associations and unions across Quebec. In March, ASSÉ is organizing a national protest as part of their national campaign against austerity. 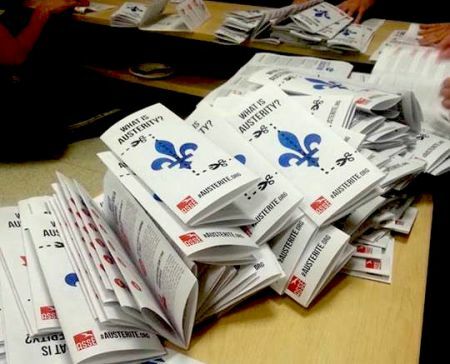 Hundreds of pamphlets explaining the detrimental effects of austerity were scattered on tables and chairs as student activists engaged in dialogue about the need to mobilize against Quebec’s recent “zero deficit” plan. The ASSÉ-produced materials indicated that corporations in Quebec were taxed at around 40% in the 1960s, whereas today, they only pay 15% in taxes. This leaves the burden of repaying debt on workers and people reliant on social programs. Austerity measures are not unique to Quebec; they belong to a global trend of imposing neoliberal economic policies like privatization, raised fees for social services, and cuts to programs and subsidies which benefit the poor. Gingras said that the International Monetary Fund and the World Bank along with governments are complicit in the spread of neoliberalism by pushing for austere budgets. Studies have demonstrated that the implementation of neoliberal policy “typically result in very protectionist markets dominated by a few trans-national corporations,” and deepens inequality. “There are alternatives to austerity,” said Gingras . “We don’t have to impoverish ourselves to get out of debt.” Some of these alternatives include reinstating a tax on capital, increasing to ten tax brackets instead of three, and resisting the increase in Hydro-Quebec’s electricity rates. The mandate for the anti-austerity campaign was decided by members at the annual ASSÉ congress in April 2013. Members in the union, which emphasizes direct democracy, aren’t only expected to vote; ASSÉ relies on them to take the next step and apply the mandates that they’ve pushed for, which in this case means carrying forward the fight against austerity. ASSÉ advocates for what they call “combative syndicalism,” which means “taking a permanent power relationship with an adversary,”according to Gingras. Through mass participation and “combativity,” it seeks to be “an alternative to the more corporatist idea of what a student union should be,” a vision typically based on lobbying and closed-door negotiations.